JEWEL NIGHTCLUB AT ARIA WILL OPEN MAY 19: JEWEL Nightclub at ARIA is set to open Thursday, May 19. The 24,000-square-foot, dual-level nightlife destination will house nearly 2,000 guests within two intimate spaces, the main club and a mezzanine level with five exclusive VIP skyboxes. A commanding staircase bathed in LED screens will lead guests to the mezzanine level, with a view of the dance floor, a stunning bar, dance floor and five “themed” VIP skybox suites: The Blind Tiger, The Studio, The G.O.A.T., The Prestige and The Gallery. VIP patrons will enter through a tunnel of arched bronze portals. RON’S STEAKHOUSE IS A HIDDEN GEM IN LOCAL NEIGHBORHOOD: Ron’s Steakhouse at Arizona Charlie’s on Decatur is five years old now and located just off the casino floor. You may not be familiar with this restaurant but it’s worth jotting it down for a grand evening out any night except Monday or Tuesday when it’s closed. 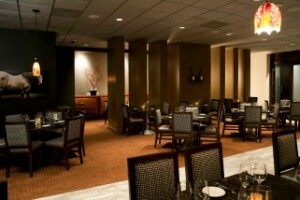 The whole meal is served tableside in a contemporary understated tranquil atmosphere with muted colors and lighting. Meals include soup or salad and good size entrée portions. 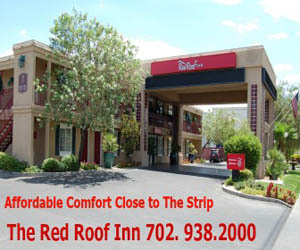 If only visitors on the Strip knew about this restaurant, they’d be paying a visit. Ron’s Steakhouse justifiably is the winner of six Open Table Diners’ Choice Awards including: Best Overall; Best Food; and Neighborhood Gem. MINUS5 ICE BAR AT MANDALAY PLACE PREVIEWED ITS NEW LOOK: Minus5 Ice Bar at The Shoppes at Mandalay Place revealed its appearance with a private VIP party. The 1,300-square-foot venue’s frozen new look includes 120 tons of fresh 100 percent pure Canadian ice. The much bigger ice cave features museum-quality carvings such as the Las Vegas Skyline, the Iron Throne from HBO’s Game of Thrones, and much more. 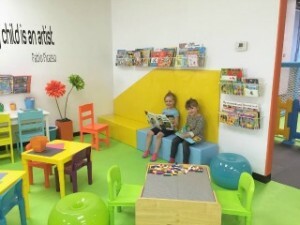 KANGAMOO INDOOR PLAYGROUND OPENS: This week, Mimi and Shawn Wachter are opening Kangamoo Indoor Playground comprising 9,500 square feet of active and creative play spaces for kids ages 1 through 10 at 1525 E. Sunset Road, Suite #7. For parents, there is an indoor track, do-it-yourself beauty stations, massage chairs, free Wi-Fi with charging stations and ample spaces to relax with fellow parents while the kids play. A café serves healthy food and beverages, with complimentary water, tea and coffee. Kangamoo Indoor Playground also has a couple of private party rooms with packages. The name Kangamoo was inspired by the owner’s child who couldn’t say “kangaroo” when she started talking. Open daily, a one-day pass is $10 for children 1 through 10, a 10-visit pass $65, and annual passes for unlimited free play $225. OTHERWISE STARTS MONTHLY RESIDENCY AT SUNSET STATION: Last week, Sunset Station started presenting a monthly acoustic residency of the rock band, OTHERWISE, featuring the brothers and star members, Adrian and Ryan Patrick. 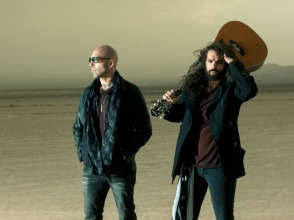 OTHERWISE premiered Back To The Roots – Acoustic Duo and will perform again: Thursday, March 24 at 10 p.m.; Saturday, April 16 at 8 p.m.; and Saturday, May 21 at 8 p.m. Tickets are available at the door for $10 ($5 with a player’s Boarding Pass). THE SMITH CENTER ANNOUNCES 2016/2017 BROADWAY SERIES: The Smith Center has announced its 2016/2017 Broadway Las Vegas series. The show lineup is: “The Sound of Music” Aug. 2-14; “BEAUTIFUL – The Carole King Musical: Sept. 20-Oct. 2; “Irving Berlin’s White Christmas” Nov. 22-27; “Fun Home” Jan. 3-8, 2017; “Motown The Musical” Jan. 17-22; “Finding Neverland” Feb. 14-19; “Matilda the Musical” March 14-19; “An American in Paris” April 11-16; and “The Phantom of the Opera” May 31-June 11. VEGAS INDOOR SKYDIVING’S HOLDS INAUGURAL TUNNEL JAM 2016: Built in 1981, Vegas Indoor Skydiving at 200 Convention Center Drive was the first indoor skydiving facility to open its doors in the United States. To celebrate 35 years of flight, Vegas Indoor Skydiving will host Tunnel Jam 2016, its inaugural flight competition pitting the city’s most talented indoor skydivers against one another for the chance to win more than $5,000 in prizes and claim the title of “Tunnel Jam Champ.” Tunnel Jam 2016 will be held Thursday, March 10 from 5 to 7 p.m. To watch the competition, guests must donate at the door one bag of non-perishable food (at least two cans), which will go to Three Square Food Bank. PATRICK’S DAY CELEBRATIONS: Celtic Feis is returning with a three-day celebration at New York-New York’s Nine Fine Irishmen, March 17–19 featuring live entertainment, specialty cocktails and authentic cuisine for the seventh year in a row. On Thursday, March 17, the festivities will kick off with live entertainment at 9 a.m. on the Brooklyn Bridge and the Las Vegas Pipe Band leading a celebratory parade through the casino at 10 a.m. Starting at noon, admission is $10. On March 13, Nine Fine Irishmen will host a four-course Guinness Beer Dinner from 6–9 p.m. Tickets start at $79. Rí Rá Las Vegas, the Irish pub located inside The Shoppes at Mandalay Place, will host its fifth annual St. Baldrick’s Foundation signature head-shaving event on Saturday, March 12 starting at noon to raise money for research to find cures for all childhood cancers. The 50th annual Southern Nevada Sons & Daughters of Erin St. Patrick’s Day Parade & Festival will be held in Henderson March 11-13. The parade theme is “50 years of Irish tradition” and will be held from 10 a.m. to noon on Saturday, March 12. The three days of celebration at the Henderson Events Plaza will include a carnival, festival, car show and live entertainment. Admission will be free; however, some activities will require purchasing tickets. On St. Patrick’s Day, all four Sean Patrick’s locations will give out 2016 St Patrick’s Day t-shirts to the first 100 people who come in after 10 a.m. The entire menu is available, but featured food will be Corned Beef and Cabbage, Fish & Chips and Shepherd’s Pie. Featured drinks are Guinness, Smithwick’s, Jameson, Bass and Tullamore Dew. There will be $20 match play for gamers from 10 a.m. to midnight. Sean Patrick’s locations include 11930 Southern Highlands Parkway, 3290 W. Ann Road, 6788 N. 5thStreet and 8255 W. Flamingo Road. John O’Donnell, resident “funologist,” Irishman and close friend of UFC star Conor McGregor, will host a booze-fueled St. Patrick’s Day bash with music at CRUSH inside MGM on March 17 and either Corned Beef with a draft beer or Irish Lamb Stew with a Red Hydrant brown ale for $20.16. ORIGINAL EAGLES TRIBUTE, HOTEL CALIFORNIA, RETURNS TO M RESORT: Back by popular demand, Hotel California, the original Eagles tribute, will return to M Resort on Saturday, March 12. The foursome will recreate the remarkable hits of one of the best-selling bands of all time inside the 2,300-seat M Pavilion at 7 p.m. Tickets are $25.99, $30.99 and $35.99. NEWSY NUGGETS: NevadaGIVES will hold its fifth statewide 24-hour online giving event, Nevada’s Big Give, on Thursday, March 10. The fundraiser benefits charities across the state and fosters charitable giving by encouraging Nevadans to give where they live. Every registered 501(c)(3) organization in Nevada is eligible to participate and receive donations from midnight to 11:59 p.m. by logging onto www.NVBigGive.org. The Hilton Lake Las Vegas (formerly the Ritz-Carlton) is presenting pianist/composer Reuel for a free limited series on Saturday evenings in the Firenze Lounge from 6-9 p.m. through March 19. 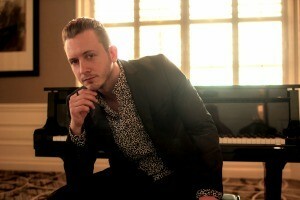 On Friday, March 18, the Hilton Lake Las Vegas is presenting Ryan Bueter and The Killer Dueling Piano from 6:45–9:45 p.m. There is no cover for this interactive show directed by the audience’s requests. DC Solar, Las Vegas Motor Speedway’s (LVMS) official off-grid mobile solar partner, will provide six solar-powered charging stations for electric vehicles at this year’s NASCAR weekend March 4-6 for 12 EV owners chosen at random. DC Solar is providing 10 LED mobile solar light towers that will be used throughout the LVMS property that weekend. Cabo Wabo Cantina, located inside Miracle Mile Shops at Planet Hollywood, will host viewing parties for upcoming Ultimate Fighting Championship (UFC) title fights, including the showdown between Rafael dos Anjos and Conor “The Notorious” McGregor in UFC 196 on Saturday, March 5, and the battle between Daniel “DC” Cormier and Jon “Bones” Jones 2 in UFC 197 on Saturday, April 23. OMNIA Nightclub at Caesars Palace will host a weekend-long affair to commemorate its first year of success on Friday and Saturday, March 11 and 12 featuring resident talent DJ Calvin Harris, Chuckie and more. Walk, roll and smile for Best Buddies Nevada will hold their 2016 “Friendship Walk” and “Celebration of Friendship” on Saturday, March 19 at Bishop Gorman High School starting at 8:45 a.m. with a one mile walk around the campus, followed by a post-event celebration. STRIP ON THE STRIP™ 5K AND CLOTHING DRIVE HAS ROUTE CHANGE: The family-friendly 5K run/walk Strip on the Strip™ fundraising event benefiting U.S. Vets on Saturday, March 5 from 7 to 11 a.m., has partnered with Circus Circus to offer a shot gun military start from the resort’s east valet before heading straight onto Las Vegas Boulevard course. Participants have the option to donate a piece of clothing at each 1K marker throughout the 5K course. Each race entry includes a swag bag, t-shirt, finisher medal, and an entry into the two-hour Official After Party at Stoney’s Rocking Country in Square with hosted food and drink. Non-race participants can buy a party ticket for $30. VEGAS HOTELS AND RESTAURANTS RECOGNIZED AS EXCEPTIONAL: Forbes Travel Guide unveiled its 58th list of Star Rating winners worldwide, bestowing Mandarin Oriental, Las Vegas with three Five-Star awards to the property’s hotel, spa and signature restaurant Twist by Pierre Gagnaire, for the fifth consecutive year. There are only nine properties worldwide that have achieved a triple Five-Star award, and Mandarin Oriental, Las Vegas is currently the only property in Las Vegas that has attained this prestigious accolade. 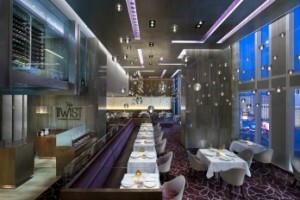 To celebrate the honor, Mandarin Oriental, Las Vegas is offering a Celebrate the Stars 2016 package that includes: a one-night stay; two unlimited-access passes to the revitalizing Tian Quan Thermal Experience at The Spa; and a four-course tasting menu for two at Twist. Pricing starts at $549; must book and travel by Dec. 23, 2016. This is the 13th and 8th year The Venetian® and The Palazzo® received the prestigious award Forbes Travel Guide Four-Star rating respectively. Also receiving the rating were Canyon Ranch SpaClub at The Venetian and The Palazzo, Aquaknox at The Venetian, and Wolfgang Puck’s CUT Las Vegas at The Palazzo. Forbes Travel Guide, AAA, TripAdvisor and U.S. News & World Report have recognized several MGM Resorts International resorts and restaurants for exceptional service and hospitality. Forbes Travel Guide honored ARIA Sky Suites, SKYLOFTS at MGM Grand and Joël Robuchon Restaurant at MGM Grand with the coveted 2016 Forbes Five-Star award. MGM Resorts earned seven 2016 AAA Five Diamond Awards including Bellagio, ARIA, ARIA Sky Suites and SKYLOFTS at MGM Grand. Renowned restaurants Picasso and Le Cirque at Bellagio and Joël Robuchon Restaurant also were honored as Five Diamond recipients. ARIA Sky Suites for the first time received a 2016 Travelers’ Choice Award for Luxury Hotels by TripAdvisor, being named third in the United States out of only 25 to make the list. Rounding out the impressive roster of awards for ARIA Sky Suites, U.S. News & World Report announced the luxury hotel as the third best hotel in the United States. 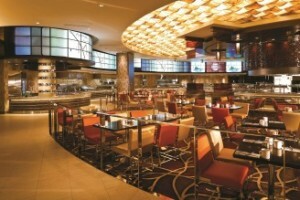 For the seventh consecutive year, M Resort Spa Casino is heralded with the Forbes Travel Guide Four-Star Rating. 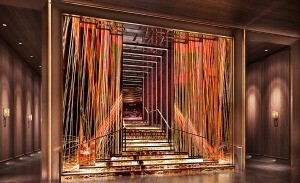 M Resort’s 23,000-square-foot luxury spa and salon, Spa Mio, also received the coveted Forbes Four-Star rating, taking its place as one of six Four-Star spas in Las Vegas. M Resort opened on South Las Vegas Boulevard in March 2009 and will celebrate its seventh anniversary this year with its Lucky 7 Anniversary hotel package. Other Forbe’s Five Star Ratings went to Encore and Wynn’s Tower Suites and Restaurant Guy Savoy. More resorts with the Four Star Rating include: The Cosmopolitan, Encore at Wynn, Four Seasons, The Laurel Collection by Caesars Palace, Vadara, and Wynn.